Even the publication of the commission’s findings which found no calls for separation in the Uzbek leaders’ words and actions has not helped to clear them of suspicion. The Kyrgyz-language newspapers are tirelessly providing new details of “conspiracies” against the country’s integrity. The campaign is obviously a sponsored one by those interested: a supposedly representative of the Uzbek community [in Kyrgyzstan] was invited to a special news conference in Bishkek recently and he alleged the leaders of the Uzbek Cultural Center in Jalal-Abad were preparing to break southern Kyrgyzstan away and gathered 30,000 to 50,000 people for doing so. This figure was immediately picked up by news websites despite the fact that [both local and foreign] mass media covered the events in southern Kyrgyzstan between April and May  in detail. Therefore, it would require no effort to see for oneself that the number people at those gatherings were about 10 times less [than the alleged figure above]. The persistent prop-up of the myth about an attempt on the country’s integrity, of course, has certain root causes. If there were separatists, then there were heroes who stopped them. At this stage, many need a legend about perished defenders of the country who died fighting the enemy. For instance, relatives, who are demanding to equalize the statuses of those who died in the conflict with those who died during the April revolution because it will entail the pertaining privileges: fame and honor, statues, benefits and compensations for those who died. The nomenclature and power-wielders need it. While the latter’s guilt in actually staging the pogroms has not been scrutinized, there are no guarantees that it will not happen in future. In a word, the heroic aureole is in demand and is based solely on the myth of “separatism”. The whole shaky ideological construction will crumble should the myth be removed from its foundation. Heroes will also be very handy during the upcoming presidential elections as well. Indeed, how else can southern officials withstand candidates from the North when they [southerners] are tagged as supporters of the hated Bakiyevs clan, are always suspected with wishing to return the previous administration and facing obstructions therefore? They will happily remind the Kyrgyz society who they must thank for ridding of the clan’s yoke and who, therefore, has the moral right to rule the country. Southern candidates’ images certainly need to be improved, and “heroization” of those who died in the recent events will surely serve that need. Besides, one’s position of the country’s defendant is very convenient for launching attacks against the revolutionaries by accusing them of supporting “those separatists”, i.e. ceding territories—a most heinous act for the Kyrgyz. This is the scenario currently portrayed in the Kyrgyz mass media and apparently it will become even more intriguing as the elections day draws closer. Undoubtedly, actions undertaken by [Kadyrjan] Batyrov to collect thousands-strong rallies and his encouragement of Uzbeks to more actively fight for civil and political rights, albeit within legal terms, frustrated the Kyrgyz section of the population because such calls hit the most sensitive pain spots. Yes, indeed so. However, claims that Batyrov-led Uzbeks activization caused pogroms in Osh are strongly doubted at least because 20 days elapsed between these two events. Why would the Kyrgyz, known for explosive temperament, wait for such a long time? Also, it is unclear why would they go and destroy Osh in response to Batyrov’s actions taking place in Jalal-Abad [100 kilometers away]? These discrepancies become explainable and understandable when one divorces these two events, because they took place in different political contexts. A battle for control over Jalal-Abad ensued between the revolutionaries and the ousted president’s supporters in April and May 2010, where Uzbeks joined one of the conflicting parties. And Uzbeks were the main victims of the criminal groups’ attacks launched in Osh and then almost all over southern Kyrgyzstan in June 2010. The politics called the shots in the country in mid-late spring last year. Conflicting parties were divided based on their pro-revolution or against revolution views. It was no interethnic division then. That is why the Kyrgyz did not hold all Uzbeks “accountable” when several Uzbeks under Kadyrjan Batyrov’s leadership (along with the Ata-Meken party activists) were seen near the ex-president’s and his relatives burnt houses in the Teyit village. They [pogrom-makers] were quite clear as to their initial target – the Kyrgyz-Uzbek University, a private university owned by Batyrov which also houses his office, when he was present there himself. The pogrom-makers were quite organized: they first had a rally where residents of nearby villages were bussed by someone, then formulated demands the Interim Government arrest Batyrov and scrutinize his actions. That is not what an uncontrollable crowd desiring to revenge behaves like. It is clear that the goal was Batyrov for preventing Bakiyev’s supporters from establishing a full control over the region. One can confidently say that there was no ethnic mobilization amongst the Kyrgyz against ethnic Uzbeks these days. Uzbeks sided with the Interim Government and thus contributed to the former’s temporary victory in this case, when the Kyrgyz of Jalala-Abad, known for their loyalty to tribal honor and solidarity, did not surrender Bakiyev. Thus, only a handful of supporters of Omurbek Tekebyaev, the Ata-Meken party leader and interim government member, from Bazar-Korgon and local Uzbeks were able to defend and maintain the Bishkek-appointed governor, Bektur Asanov. The interim government would not have to sacrifice ally Batyrov, who had to leave the country, should its position be stronger in the south. Besides, the Osh tragedy could also have been avoided if the revolutionaries controlled the south. 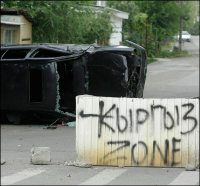 Explosive sentiments were slowly breeding in Osh for the last several years. Activation of youth groups on both sides was clearly increasing following the recent change of power in Bishkek. According to police officers’ and local residents’ accounts, any minor incident between a Kyrgyz and an Uzbek (even such trivial event as a traffic accident) would see instant gathering of tens of both Kyrgyz and Uzbeks ready to tear the other side into pieces. This readiness to take “the war path” was later used by the other side as proof of the “Kyrgyz planned to annihilate Uzbeks,” and “Uzbeks planned to chop Osh off.” Both sides were preparing for a big fight. But what it the real reason for such a mass mobilization? The change of power in Bishkek was bound to have an impact on the southern capital—the center of the shadow economy of the south. The March 2005 revolution triggered a redistribution of influence zones, which was accompanied by seizing property and killing of rich and known people. The “Uzbek factor” was not utilized in politics at that time and the revolution along with the fight for power and property took place within the major ethnic group. The Uzbek businessman merely waited the storm over and then simply started dealing with new “patrons”. However, the Uzbeks did voice their claims to enter politics following another revolution after five years. What implications would it have for the shadow economy? The corruption schemes and mechanisms are very close in nature to those in other post-Soviet countries. However, there is a principal difference in this case: the so-called patrons in this case are representatives of one ethnic group, whereas the “clients” belong to another ethnic group. Such a division of patron-clientele relations is unique in the post-USSR countries. The “read team” was composed of officials, law-enforcing agencies and criminal notorieties (closely related to the former) -- ethnic Kyrgyz; and the “blue team” – successful ethnically Uzbek businessmen and entrepreneurs. Both parties used the services of unemployed youngsters, who too were divided based on their ethnic belonging and trained in segregated sports halls under the criminals’ control. This was the status quo which started cracking after the change of power in Bishkek. The Uzbek leaders voiced their plans to the political establishment, and big “shadow-masters” sensed this would not end well for them. Because just like in any other country, a high official position in Kyrgyzstan entails a reliable guarantee of protection of the official’s businesses from mafia. That is why official positions are so hotly contested in this country. The Uzbek leaders would be able to boost their statuses and become unreachable, once they become official figures. And this would mean the “patrons” in Osh would lose a daily share from restaurants, cafes, businesses, and private entrepreneurship. There were already several cases when businessmen refused to pay: why would one want to feed an official and his family when s/he would soon be fired by the Interim Government? There was no single person doubting that changes were about to occur in Osh as well because officials ranking from hi to low were being replaced throughout the country. Such a move would entail a situation where the “Uzbek segment” of the income source could leave its “Kyrgyz patrons” and rely on those ethnically closer ones—the “Uzbek patrons.” Hence, it was only possible to stop the initiated crumbling of the corrupt schemes through a skirmish. The Uzbek side of the conflict—significant and medium-size businesses and mafia groups—had a clear vision of an imminent action to be faced, and mobilized their supporters. But apparently they did not even presume that the onslaught would be at such a horrendous scale. Many eyewitnesses—Kyrgyz, Uzbeks and Russians who were able to save their own lives, to protect neighbors of different ethnicity and to withstand marauders and pogrom-makers—told the author that they faced an organized crime and killings for the sake of personal enrichment. There are testimonies that the city of Osh was divided among the pogrom-makers into sections, and the looted goods were delivered to “headquarters” in each segment where the “booty” would be loaded onto trucks which hauled them away to nearby villages where the pogrom-makers from. This was an audacious criminal action at an unprecedented scale, which was later dubbed as an interethnic conflict. It is important to realize that the past, present and most probably future problems between the two ethnic groups were the actual cause for the conflict. The standoff was initiated by mafia bosses, enjoying support of officials, and it later brought about the division of the country along ethnic lines and consequent mobilization of the Kyrgyz ethno-nationalism. As is hence seen, the national commission has misplaced the cause and effect factors, which is undoubtedly a grave mistake. It is not difficult to understand the authorities’ predicament. The criminal world emerged victorious after the first round. It will remain the stronger side until its role in the events in southern Kyrgyzstan is objectively scrutinized and each perpetrator of assaults, pogroms and atrocities is proven guilty and individually called to account, including those covering their backs. It will remain victorious unless the country’s citizens believe in the verdict. However, it is almost impossible to witness this given the status quo in the country. Yet, if this does not happen, the myth about separatism will become truth and thugs will become heroes who deserve to rule the country. But relatives and brethren, Kyrgyz and Uzbeks, will continue living with mutual suspicions. What will this lead to? As is known, the shed blood wants more blood and only justice is capable of breaking this deadly circle. Editorial note: Sanobar Shermatova is a journalist, an expert on Central Asia and a member of the Experts Council of the RIA Novosti. The article was written exclusively for the Fergana International News Agency.